As the summer draws to a close it is important to not forget there are jobs that you can still do over the winter to protect your garden and to make the jobs easier at the beginning of next season. Dig soil if it is not frozen and remove any weeds, allowing air into the soil; this can aid the drainage during the wet winter months. Aerate your grass too. This allows the root structure room to move and it allows for any rain to penetrate into the ground and not to sit for any length of time causing damage on the surface. Winter is the time for pruning shrubs, however it is important that it is the right time to prune the ones in your garden. Winter is a great time for sprucing up your garden paths, remove any weeds and make sure they are not going to become an ice rink in the winter. If you have plants that need protecting from frost it is important to know what you are going to do with them before the first frost. If you need to purchase any protection or if you are going to dig up the plant and move it, knowing your plans in advance will make the task easier because you will be ready. 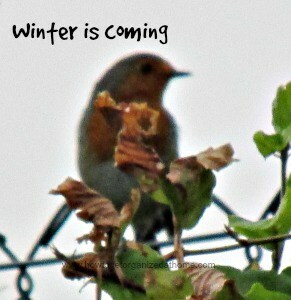 It is important that you look after the birds and wild life that ventures into your garden during the colder months. A bird bath that is kept frost-free is essential along with food that is away from predators. Homes for the bugs in your garden is a new idea that is growing in popularity, if the good bugs have places to live they might help get rid of the bugs who cause havoc. Remove dead, dying foliage and rotting wood that will cause potential damage from your garden, this can prevent damage in the winter months when the wind and the rain are at their worst. Check garden buildings for damage, it is a great time to do any repair work before the worst of the winter weather arrives. Service your garden equipment, ensure that all tools are sharp and clean and oil any joints so when you go to use them they are in good working order. It is possible to plant bare rooted stock during the colder months of the year including hedges and rose bushes. Check the instructions on each plant to ensure they will thrive. Whilst there are always jobs to do in any garden, it is also important that you can learn to enjoy the space too. Sometimes it might feel that it is hard work and there are always jobs you need to do and whilst in my garden this is true, I always try to just get outside and appreciate the space. Therefore, whilst I have set myself hard landscaping challenges this year I have begun to appreciate the changes and the overall benefit they will have on my garden in future years. There is still a long way to go and whilst it’s been hampered for a few weeks by bad weather it is really starting to take shape.